It’s an amazing app with so much power. I’ve had it since it first came out. It’s amazing. The best metronome there is! This metronome is great! It's wonderful for figuring out polyrhythms, training your sense of time, and much more! I use it every time I practice. Definitely buy this metronome; it's worth it. This thing comes with a ton of tools and features. You can customize time signatures, divisions, and even the sound of the click from a huge variety of sounds. You can make your drum tracks entirely from this app. Definitely a must have for any musician looking for something as simple as a click to their own custom set. This is the 4th metronome I've bought from the App Store and it has become my hands-down favorite. In fact I can't tear myself away from it! The ability to mute a user-defined number of measures is a KILLER feature. In my genre we play a lot of dance tunes with 8- bar parts. With this app I can make the clicks audible for the first 8 measures then mute the next 8 measures and so on ad infinitum. This is incredibly useful in that it lets me see if I am speeding up or slowing down. I do this by closing my eyes and listening to see if I land back on the beat when the click starts again. I can feel my groove getting steadier after just 24 hours! 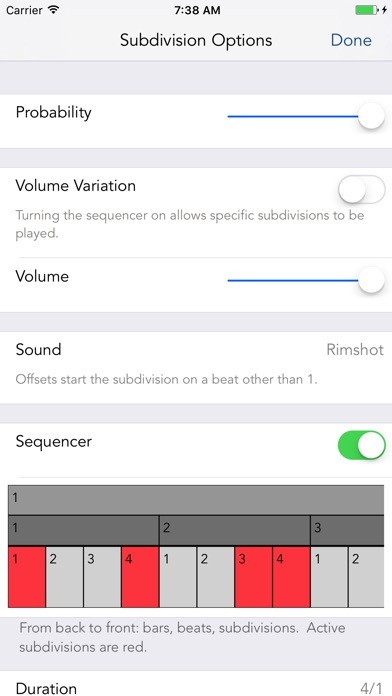 Letting the user define the number of measures that are audible vs. those that are in audible are what sets this app apart from another app that mutes the beats randomly. That sounded cool at first, but in practice I found that the intervals of audible clicks vs. inaudible clicks were much too short to pose a challenge. Not so with Metronomics. This app gives YOU complete control to set the bar as high or low as you want. So get Metronomics -- you won't be disappointed. Love, love, love this app! This metronome is extremely customizable. Goes up to 500 bpm, you can select any beats that you want to hear in a measure. You can do anything that any other metronome can do and more as far as I know. The possibilities are more or less infinite, as there really aren't any noticeable restrictions. Buy this metronome if you want something that can handle any sort of rhythmic feel or situation that you could ever think of. Also, thank you for making this! This is quite drummer friendly. Polyrhythm counting sounds awesome. This is the only app I've ever paid for. I would recommend this to any musician, especially any drummer. I use this to write complicated drum fills or polyrhythmic drum grooves and listen to how it sounds. It has many selection sounds of a full basic drumset and you sequence them to write out quick little parts. After I've created it and listened, I slow it down then learn it on my drumset. Worth every penny!! Glad I bought this app. I love this app. It makes practicing more fun. It has a beautiful and easy to learn user interface. I have tried many metronomes and this is the best one, period. It has made me a better player. Best of the Metronome Apps! I've probably gone thru a dozen different metronome apps but with the latest release of Metronomics, I finally have everything I want in a metronome in one app. It's very flexible and full-featured but the interface is way more intuitive than the other apps I've tried. I've also found the author to be very responsive so I couldn't be happier. This metronome has helped me so much with learning time. I'm not able to play fast things at normal time while still knowing where the upbeat is! Metronomics is a great tool — easy to use and has all the features you could want in a metronome. It has everything I need as a professional player and is great for my less experienced students, too. The new interface looks great and the new animated subdivisions are a nice touch as are the new options to speed up/slow down over time. Great Metronome! It does everything! I remember paying $100 for a Dr Beat 15 year ago. This does three times the stuff for only a fraction of the price! Great app. This is a seriously deep metronome. Amazing app. This is a versatile and powerful app. There are features that expand on simple metronome usage such as meter, audible/inaudible bars, tempo alteration (ramping). Add to that randomized cross rhythms, rhythm layering, odd meters, and a variety of samples, and you'll have enough tools to practice rhythm from any perspective. Highly recommended. Goodbye Dr. Beat. I really like the sound choices. Perhaps add a visa blue square under the subdivision that would blink - that subdivision. Nice visual cue option (turn on/off switch) to help teach students. I'm a 25+ year music teacher. Metronomics is the most versatile metronome I've seen. It seems to have an almost endless number of features for customization. The random rhythm option makes this app very unique and fun to practice with. Great for beginners as well as pros! Best metronome for the serious musician! This is the best metronome that I have worked with. The polyrhythmic feature by itself is worth the download, not to mention all the other features that come with it. Best metronome for any serious musician!! Great sounds that are easy to change. Endless subdivision choices. 500bpm!! And best of all it has accurate settings of bpm (unlike many metronome apps that I have used). A highly recommended practice tool created by a musician for musicians! I can't recommend this app highly enough. Incredibly user-friendly, flexible, stable, and sounds good. The majority of my metronome usage is a simple click at a simple tempo -- this metronome sounds and works great doing that, of course. But the way that it can be adapted to basically any rhythmic pattern, with full volume control, sound sample control, probability control, has made it an indispensable part of my practicing, especially for complicated rhythmic material with original claves, etc. The ability to save, transfer, and customise is unbeatable, and the price is totally a bargain. This is THE metronome you should get. Worth every penny. Makes practicing a lot more fun, too. I am not a fan of the iOS7 interface though... Way too bright, white, and hurts my eyes to use it... Like most of the iOS7 updates. 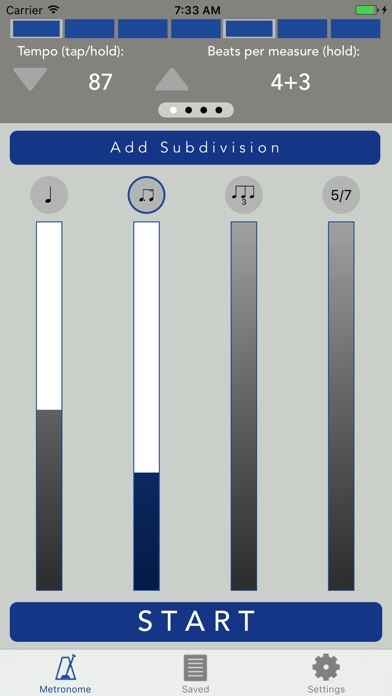 No other metronome app has everything this does. I needed to find a met. that I could program to loop, change meters and speed up gradually. This does it and so much more like creating polyrhythms and periodically going silent to test your internal timing. Now I can program a click track to a complicated song and never touch it. This is a great practice tool! It makes you wonder why nobody thought of it before. Cool options that are unavailable on other metronome apps. It's an awesome metronome. I use it all the time. I'm very happy with the Metronomics application, especially with the ability to easily set a swing time. If there is another product with the power and ease of use that his has, I'm not aware of it. For music practice this is a great product. I agree with the reviewer who suggests a voice count option a la Boss, but other than that can't think of any lacks in this app. Fantastic metronome! I use this app everyday. Love that it tracks my usage. Sounds great in headphones too! Keep up the great work! You must get this metronome! This is a must have tool for musicians of any skill level. 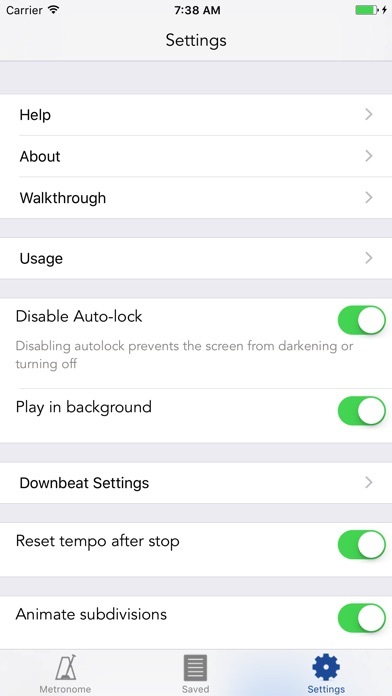 There are so many options and customizable settings to help work on your time. Great job!!! This is hands down the best metronome app! The sequencer feature allows you to custom build a metronome with any phrasing imaginable. I set up a click in 19/16 to practice Keep it Greasy. Highly recommend this App. I love this app, the metronome is super adaptable and very helpful for learning music. Definetley the best metronome on the App Store. This has been my daily use metronome for years now. There's nothing in your way when you want to just want to sit down and practice, but the possibilities are limitless when you want to challenge yourself or need to figure out something complicated. Add and subtract custom subdivisions and rhythms, choose from a range of great sounds, and save metronomes to use later or share with students and colleagues. And I still can't get over how brilliant the mixed meter screen is. My drum set drowned out my old metronome. Practice meant counting out and often stopping (my bad habit). I can now hear thanks to a headset. The available options makes repetitive exercises bearable thus allowing for a efficient practice. This app was purchased solely on recommendations, ad my name to the list. This metronome is great for a multitude of uses! It does everything you would need and more. 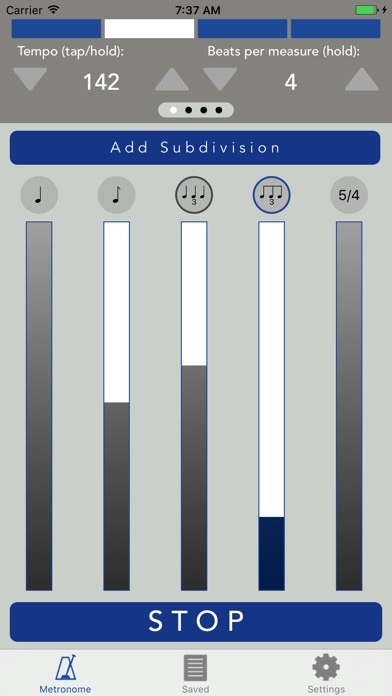 If you use your iPhone for a metronome, get this app! - LOUD with variety of sounds - use as simple or as complicated as you'd like - tap tempo by actually tapping on the tempo - very Apple-like Buy this metronome! Does a great job on iPhone and iPad. New Mac version is wonderful, as well. This app is so close. How could there be no front page accessible set list? If you'll add a set list function under which I can save songs and access them with increment/decrement buttons I'll change my rating to a 5! Anyone from the beginner to a pro will benefit from this app. I've played drums about 35 years. Best metronome for the price anywhere. 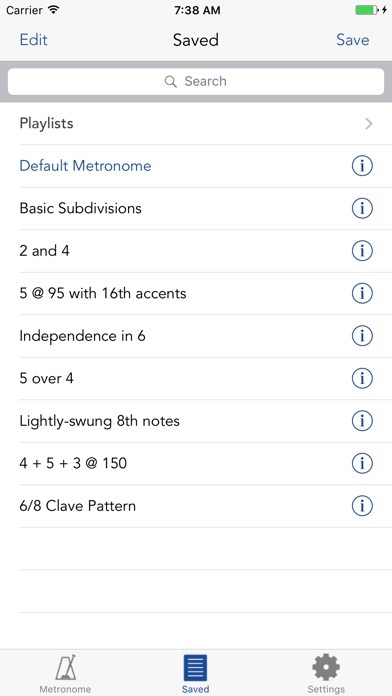 There are now a handful of capable advanced metronomes available for iOS; each with its particular strengths and uses. This original version of Metronomics continues to be my work-horse metronome. Not just for basic time-keeping, but for the kind of learning and goals that keep me growing as a musician. It is extraordinarily flexible and well-designed. The developer releases pretty regular updates to keep it running smoothly. The included sounds are quite good. However, as that is largely a matter of taste, if you want to customize your sound set, you might consider the HD version of the app (available separately) which allows you to import wav samples and share both sounds and presets via iCloud. There is no question in my mind that this is now THE standard by which every other metronome should be judged. I hope the sharing gets fixed, but even without that this would get five stars. The best metronome app I've found! Features I never even thought I needed and now can't do without! Wonderful product, well thought out design, highly recommended. It works well, but the app has actually gotten significantly uglier these past two revisions. Best metronome available! Loaded with tons of great tools and settings! Simple to us and very helpful as it is a great practice tool for developing a sense of time for the piece you you're working on.